FLVS student Cristi McKee has been a member of the Creative Writing Club since 2012 and is the Editor-in-Chief and founder of Tallahassee Teen Magazine. In a recent interview with club students, she answered questions about her experiences as an intern with Tallahassee Woman Magazine. What motivated you to found Tallahassee Teen Magazine? I always wanted to inspire teens through writing, but I never could figure out how – until December 2015. I took my love for writing and approached a local magazine and their publisher, Tallahassee Woman Magazine and Kim Rosier, and told them that I was interested in starting a magazine for teenagers that would be filled with inspirational, encouraging content while also celebrating local teen’s accomplishments. Soon after, Tallahassee Teen Magazine was founded courtesy of Tallahassee Woman Magazine. What do you enjoy most about editing and publishing the magazine? I love reading the articles that people write and seeing what other teenagers have to say. It inspires me and encourages me to try writing in different styles and formats and to expand my writing horizons. I love the fact that people my age have a chance to get their work, be it creative writing, journalism, or pictures, in a printed/digital, professional magazine platform. Editing is great because it helps me look at writing from different aspects – not just the reader’s aspect. Publishing is also great because it enables me to see graphics and writing from all aspects. Through the process of editing and publishing, I’ve learned so many wonderful skills that will help me in the future. As an editor / publisher, what advice do you have for our members who are interested in publishing work or getting into the field? Simply try. If you are interested in sending in work to a publisher, send in work to a publisher. If you want to begin a platform to share your work, try it out. You may receive rejections or negative feedback, but keep trying. You never know what could happen! Your work could be exactly what one publisher is looking for. If you plan to go into an editing/publishing field, I would look into local internship/externship opportunities. Many small businesses offer summer internships for high school students. Internships really help you prepare for future careers. How do you see your relationship to writing as a writer vs an editor? As a writer, I get to write from a reader’s point of view – I write to appeal to the reader, but also to relate (based on personal preference, opinion, and past), so I write what would interest myself as the reader. As an editor, I look at the mechanics side of things. I have to think as if I didn’t write the article and am not reading it as a reader, but as someone who is looking for grammar/punctuation problems or awkward word flow. Writing is definitely more fun than editing, but both are extremely rewarding in the end. What are you interested in doing as a writer / editor / publisher after high school? After high school, I plan to remain as editor of Tallahassee Teen Magazine until I’m no longer a teenager. I plan to major in advertising and hope to use my writing skills to succeed in it. I also plan to join clubs in college that are focused on creative writing and/or journalism. 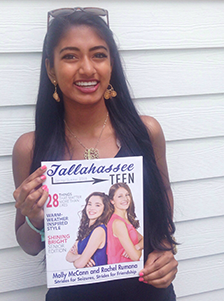 The Fall/Winter issue of Tallahassee Teen Magazine was just released online. You can find it here! Cristi McKee has loved writing her whole life. In addition to Creative Writing Club, she also serves as the Arts/Entertainment Editor for the FLVS Newspaper and is a member of the National English Honor Society. When she’s not writing, she’s singing, outside, participating in church activities, playing mandolin and ukulele, spending time with her family and friends, or baking. In the future, she wants to major in Marketing in college and attend Duke University. 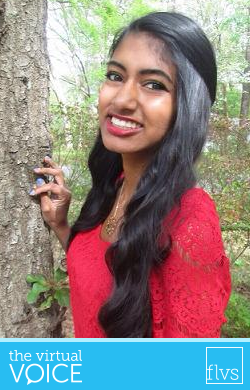 As Editor of Tallahassee Teen, she hopes to inspire and motivate teens within the community. This entry was posted in Full Time Edition, Homeschool Edition, Parent Edition and tagged Clubs, creative writing, Creativity, Editing, English, FLVS Clubs, FLVS Student Newspaper, Internships, Language Arts, Newpaper, News in a Click, Publishing, Student Activities, Student Interview, Student Spotlight, Student Voice, Tallahassee Teen Magazine, Tips for Students, Writing on March 13, 2017 by Guest Blogger.